So hey! 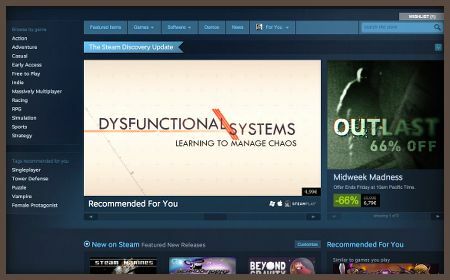 The much rumored Steam overhaul is here, promising to bring all the changes you’ve ever been hoping for! It’s still too soon to judge how (and even if) it’s going to affect things in the long run, but I thought I’d share my early impressions, based on my own experience and conversations with other indie devs. Hot damn is it blue! The main capsule finally shows me something I haven’t seen a thousand times (and got already). Including some older and/or niche titles. Major improvement here! Curators are cool. Already found a few with tastes similar to mine. 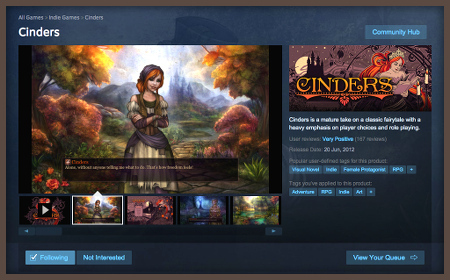 Cinders sales and traffic went up almost thrice, and I’m hearing similar reports from other indies. It will undoubtedly calm down after the dust settles, but I’m guessing it’s still gonna settle on something higher than before. Mind it’s for a title way into its long tail. As a niche developer, I like that they put more weight on user reviews. Games like ours usually have a small but very supportive audience, which results in a higher than average reviews-to-sales ratio. The new system promotes fan favorites, giving them some welcome extra visibility. Same thing applies to tags and recommendations. According the the new analytics tool, we’re getting quite a lot of traffic that we wouldn’t get in the old system. That traffic also seems to have a pretty high conversion rate due to better targeting. Speaking of the new analytics tool. It’s very cool! Allows you to see where exactly your store traffic is coming from. Invaluable data given how complex and vast the Steam ecosystem is. Curators are yet another group of people indie devs will have to kiss up to, but such is life. They’re still vastly better than Valve deciding who’s allowed to see our stuff. That said, so far the curator traffic is negligible. Soo… Are we supposed to email curators? Hand them keys? Is it moral and doesn’t it defeat the whole purpose? I’m still unsure what the code of conduct’s going to be here. It seems it’s going to be easier to maintain a reasonable long tail on Steam now, as interesting games are at a lower risk of getting completely buried than before. I’d say launches are going to be harder, though, and require a bigger and more focused marketing push (or a considerable ad budget) to get things rolling. Most new releases will get even less visibility than in the old system. Reaching that critical mass of features and recommendations is going to be crucial. I think the next step is the official shutdown of Greenlight and replacing it with an open AppStore-like model. Expect it soon. Overall, despite my general Steam-skepticism, I’m pretty optimistic towards the new storefront. Early signs are promising: most of the shovelware should get buried fast, hits will remain hits, and underdog fan-favorites are given a second chance. It’s all good and I don’t see any immediate drawbacks or risks.